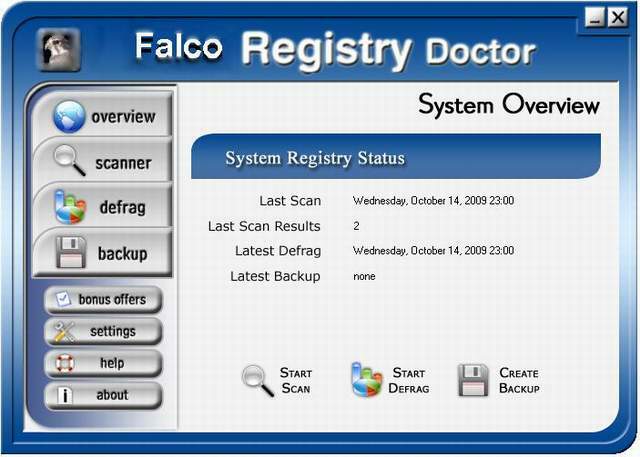 Falco Registry Doctor allows to scan your operation system's registry, find errors and fix them quickly. Making your system work correctly. Don't worry about work ability of your operation system, Falco Registry Doctor will make it for you! It is a useful program for registry defragmentation. You can easily restore your operating system's speed and reliability by using this program. It includes several options for scanning and defragmentation. Qweas is providing links to Falco Registry Doctor 1.2.4 as a courtesy, and makes no representations regarding Falco Registry Doctor or any other applications or any information related thereto. Any questions, complaints or claims regarding this application Falco Registry Doctor 1.2.4 must be directed to the appropriate software vendor. You may click the publisher link of Falco Registry Doctor on the top of this page to get more details about the vendor.